Welcome to our Southdown School Council page! Our new School Council was elected at the start of our academic year in September 2018. We were elected by our peers and pride ourselves on setting an excellent example to fellow pupils. We are led by two of our teachers, Miss Shaw and Mr Jones. We meet regularly to discuss concerns or issues regarding our school and carry out projects and tasks to support Mrs Chisholm. 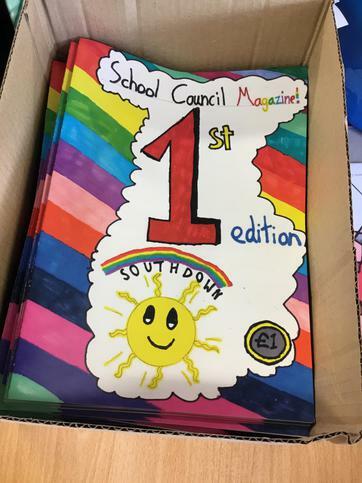 Our new big project last year is the introduction of the Southdown School Magazine. We hope to continue to publish a magazine every term. The first magazine sold 220 copies and was very successful! We have been working very hard to improve our school. Come back soon, to read about some of the issues we have been discussing at our meetings! This month we were very lucky to be able to visit the Chairman of Flintshire Council, Cllr Paul Cunningham. We went to Flintshire County Hall and had a great time exploring the Council Chambers and ask questions about how the council is run .